I love Exploring Nature with Children! 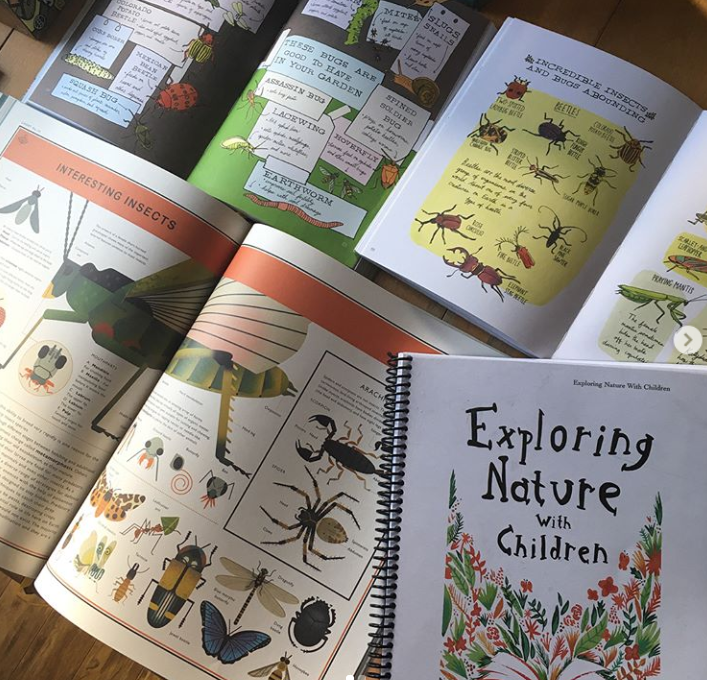 This is a great introduction to nature for kids. 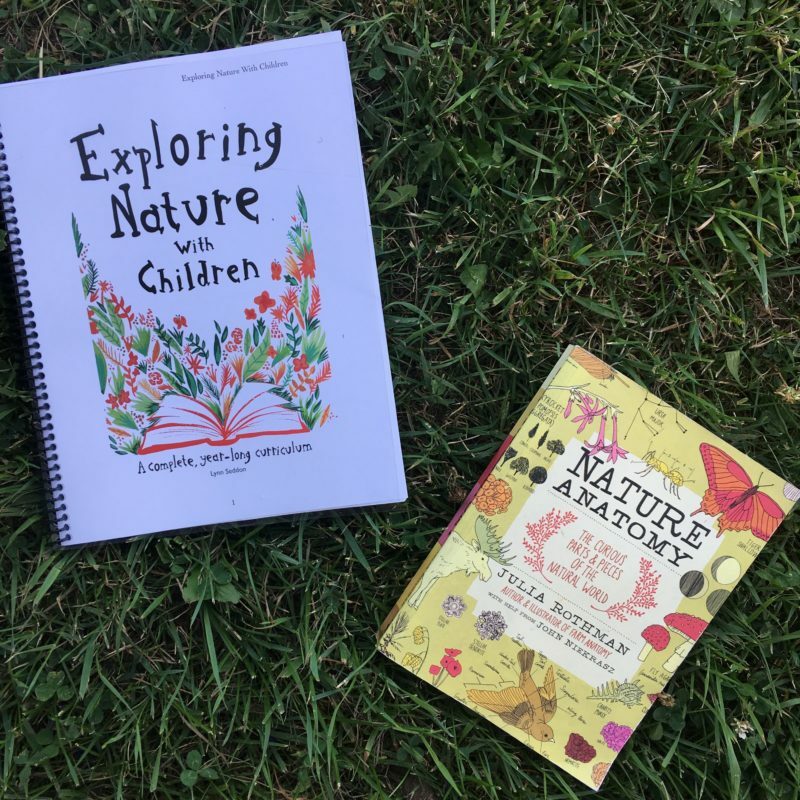 Offering guided lessons year-long, this nature study curriculum can help inspire weekly nature topics, nature walks and journaling. 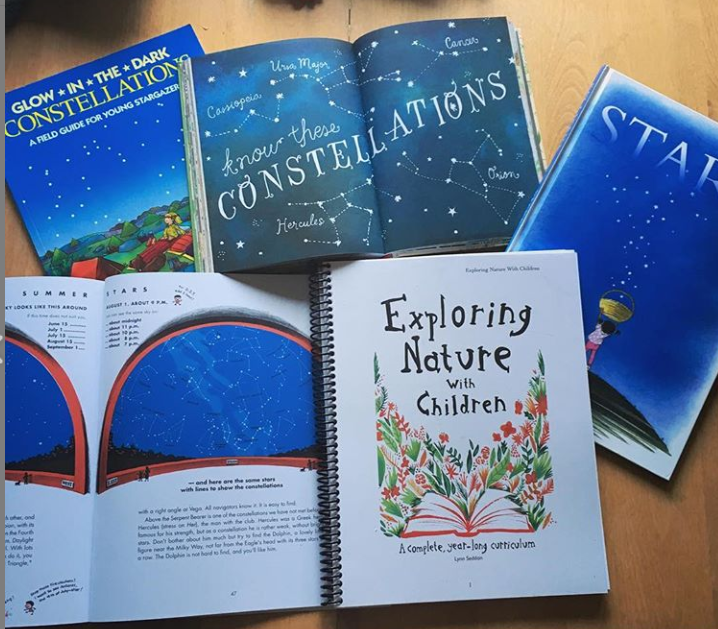 This curriculum recommends using the Handbook of Nature Study alongside it. 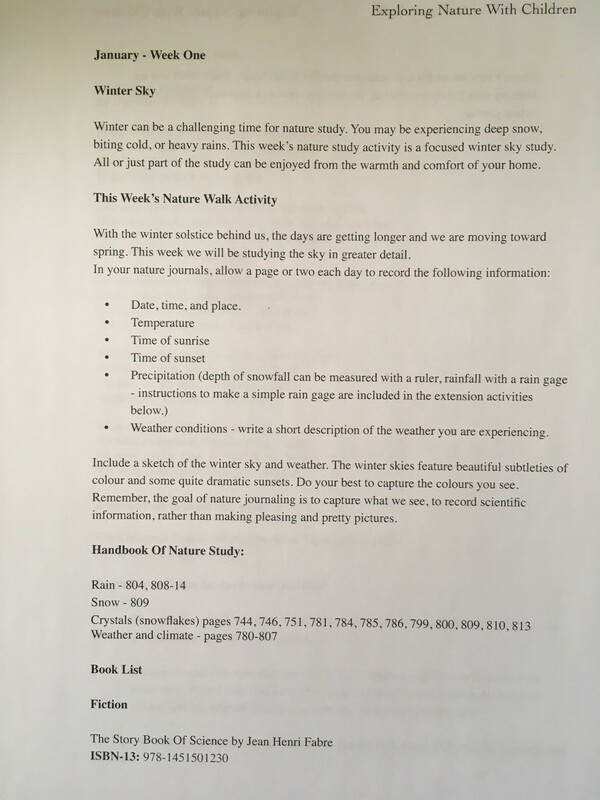 For each week they have corresponding pages in the Handbook of Nature Study. 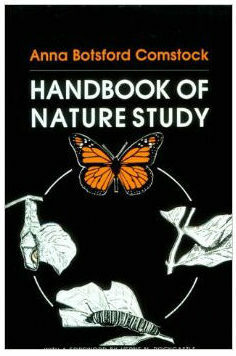 I honestly don’t have this book, but own many other nature books. You can definitely use whatever nature books you have as supplement. Each week offers a theme of what you’ll be learning about. For example, one week in August it might be the Perseid Meteor shower, another week it will be cloud shapes. 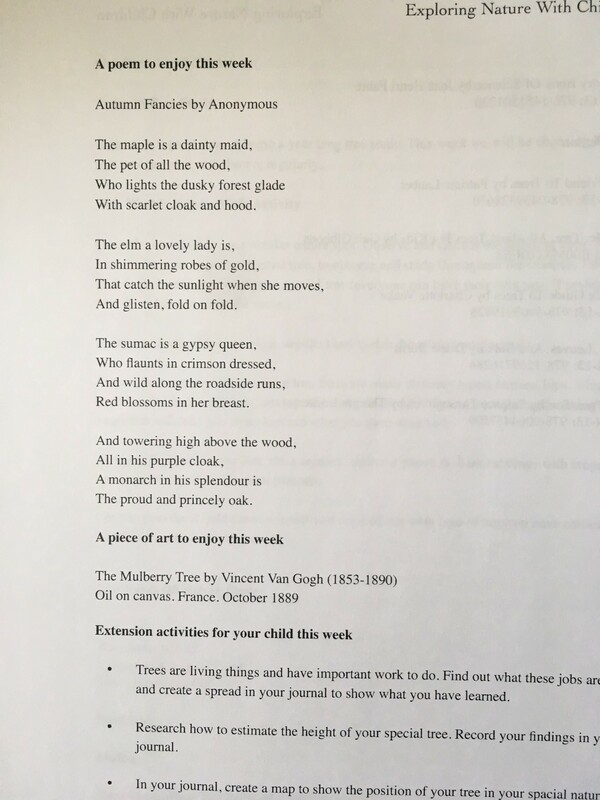 There are short lessons for the parents to discuss, additional books to use, poems and nature walk tips for the month. The age range for this curriculum is for the early elementary. 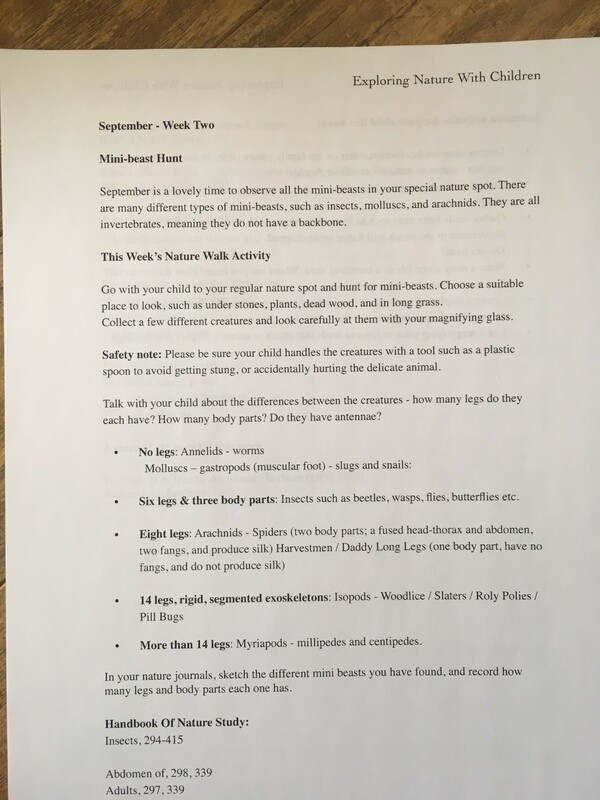 However, the weekly themes can be adapted and help guide nature studies for older students. You can go as light or as in-depth into each topic as you’d like. 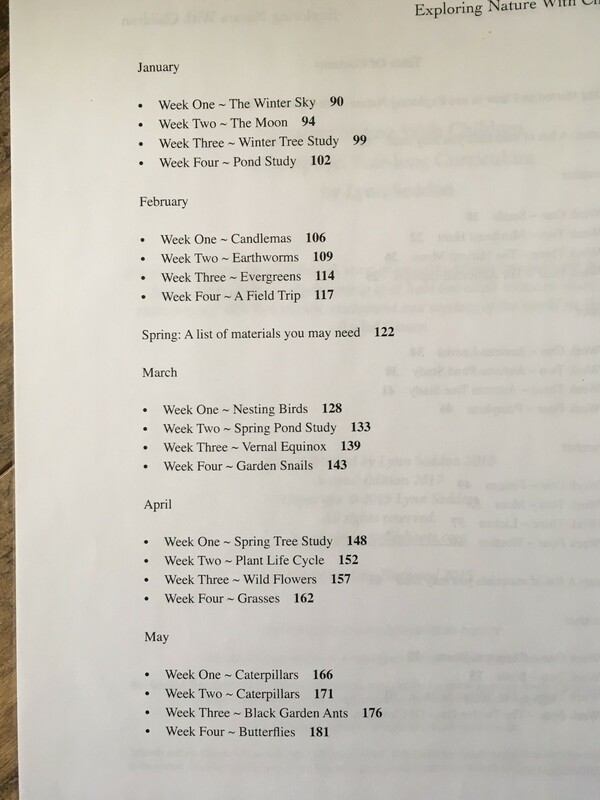 Maybe your kids really loved the week about butterflies and want to study that for a whole month! 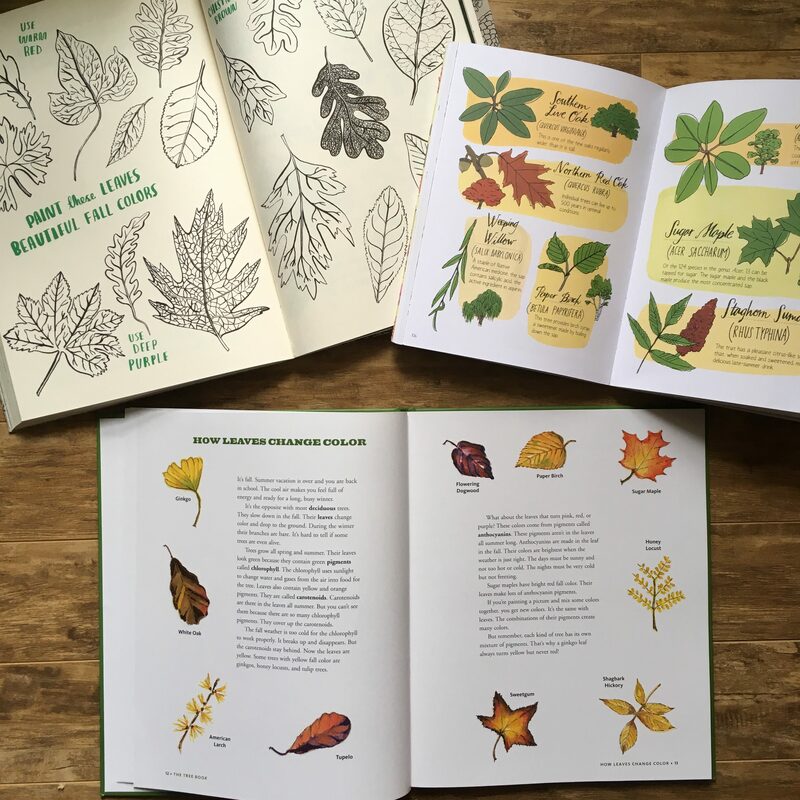 You’ll want to add visual books to your nature studies to really see what you’re learning about. 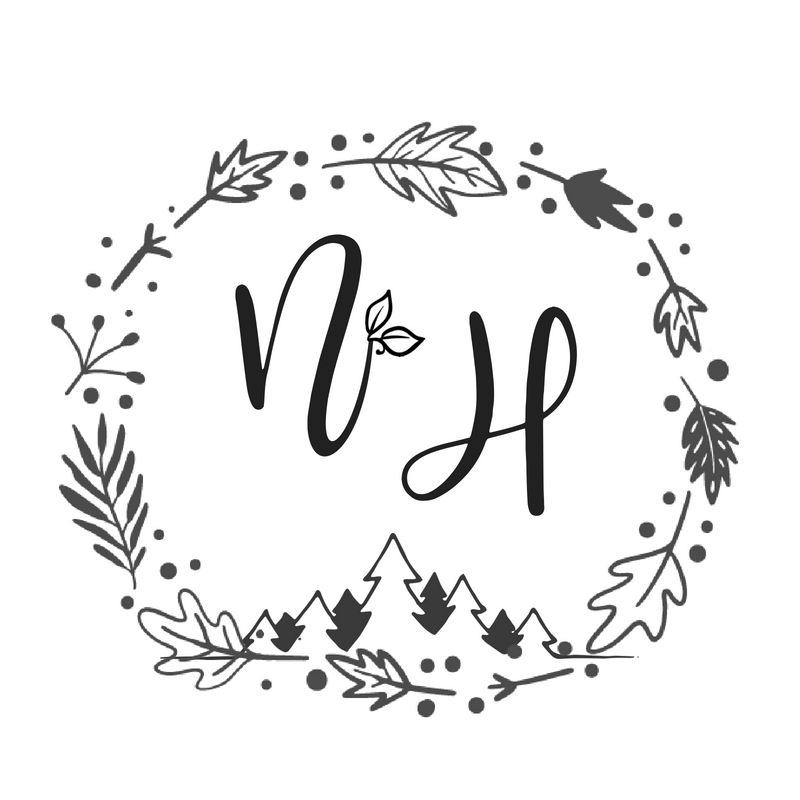 I’ve shared my lists of favorite nature books before in this post. Please note that when you buy this curriculum it comes as a pdf file. I had mine printed locally. 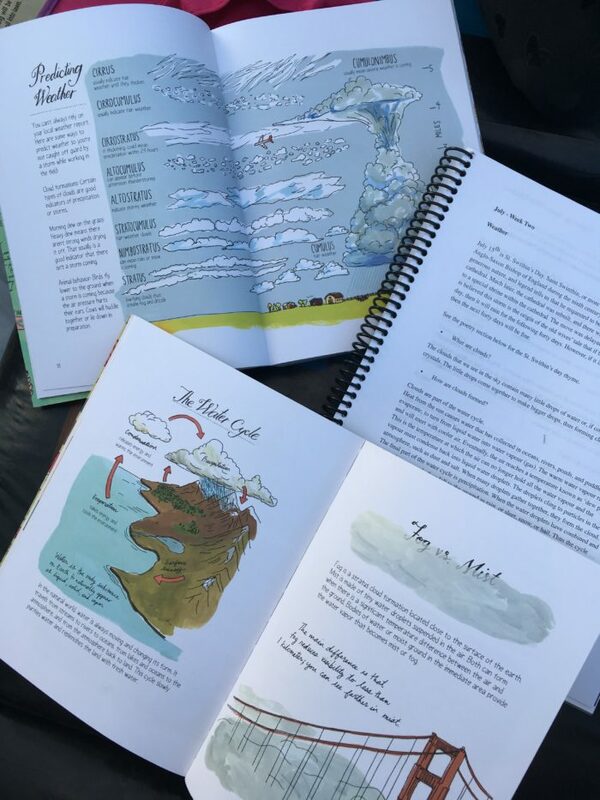 Many homeschoolers get pdfs printed with the Homeschool Printing Company. Here are some inside contents and books I used for that week. 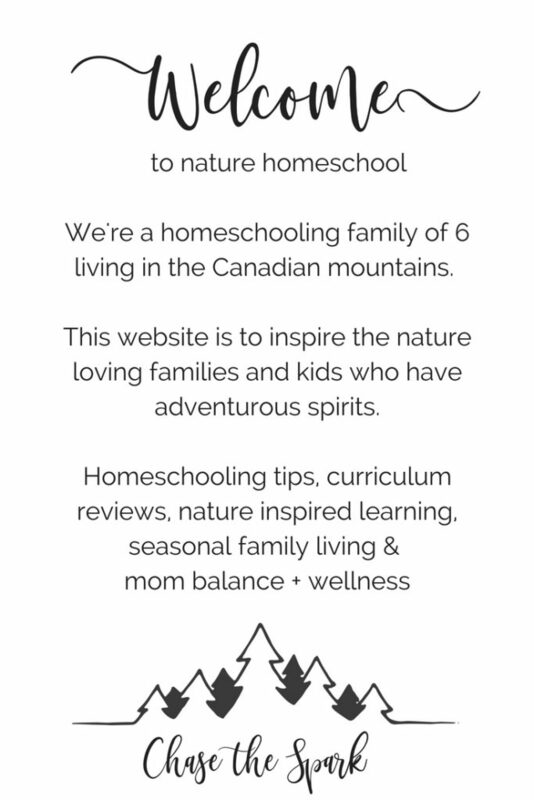 You can see all of our homeschooling on my Instagram on Nature_Homeschool. Our mini-beast week for September. We went around our garden and looked for bugs we could find. Then we used some books as resources. All in all, I’d recommend this curriculum for families that need that spark each week for what to study. Even though our family is around nature all the time, having some topics laid out and some instruction is nice. The lessons are sometimes two pages, other times quite short. Then you use your nature books to inspire further study. 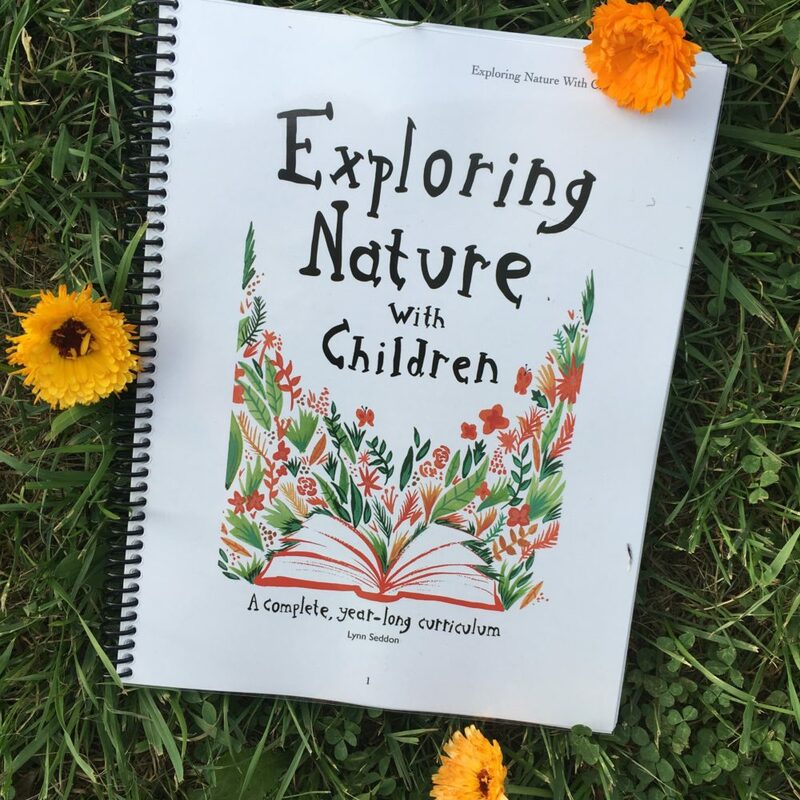 Have you used Exploring Nature with Children before? Thanks for this review. 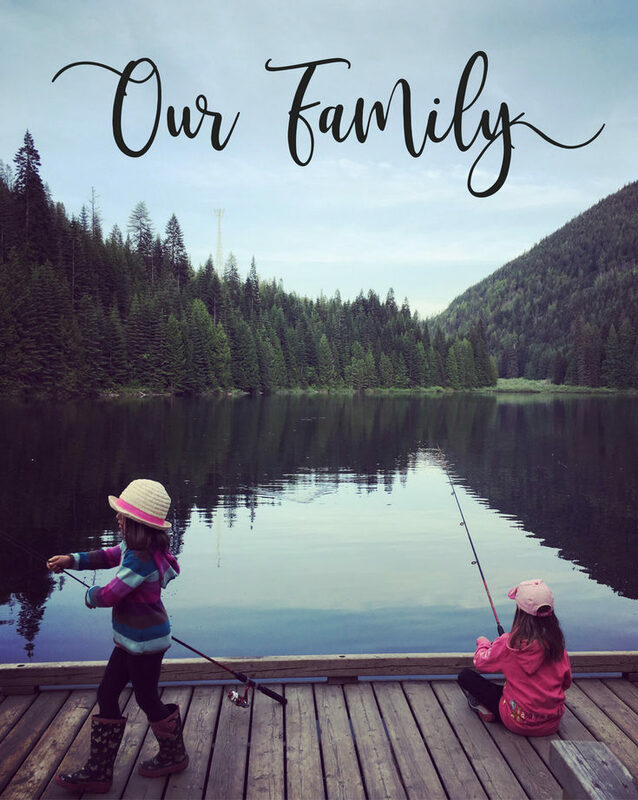 I have been considering this product for our family. How do i order? I can’t find where to get this curriculum at?